Slide-Lok has just introduced a new cabinet finish choice to the garage cabinets and garage storage markets. This latest addition is expected to significantly enhance Slide-Lok’s existing market leadership. Phoenix, AZ (PRWEB) August 18, 2006 -- Garage Storage market leader Slide-Lok, headquartered in Tempe, AZ, has just announced the latest addition to the company’s line of available finishes for its garage cabinets. With the addition of the new "Red Alder" finish, Slide-Lok expects to extend its leadership in the garage cabinets market. "The garage storage market has become increasingly dynamic over the past few years, and Slide-Lok is leading the way by providing its customers with more choice than ever before," says Brian Strayer, Slide-Lok's President. In addition to Slide-Lok’s existing line of finishes for its garage cabinets (natural maple, white maple, oak frost, and white), Slide-Lok is now introducing Red Alder. The new finish can now be ordered directly from Slide-Lok or through dealers of Slide-Lok garage cabinets. customers are not only demanding more choices when it comes to garage cabinets, but that many customers desire a rich garage storage cabinet finish. To accommodate this desire, Slide-Lok has introduced its Red Alder finish, rounding out its line, and giving customers an exciting new choice. 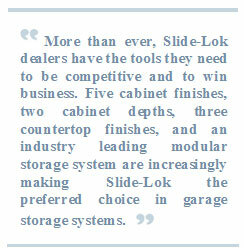 Now, Slide-Lok, and dealers of Slide-Lok garage cabinets, can offer more to their customers than ever before. Strayer states, "More than ever, Slide-Lok dealers have the tools they need to be competitive and to win business. Five cabinet finishes, two cabinet depths, three countertop finishes, and an industry leading modular storage system are increasingly making Slide-Lok the preferred choice in garage storage systems." For more information on Slide-Lok garage storage products, contact Slide-Lok at 1-800-835-1759 or www.slide-lokofthebayarea.com. Consumers interested in locating a Slide-Lok dealer or in purchasing online can visit www.slide-lokofthebayarea.com. Since 1977, Slide-Lok and its parent company Bass Cabinets have been producing high quality, durable cabinetry. Slide-Lok’s cabinets utilize a patented dovetail design, plywood construction, adjustable 6-way hinges, and Thermofuse doors—making Slide-Lok the quality leader. Slide-Lok’s dealer network includes more than 100 dealers across the United States and Canada.